I’ve read several stories and columns about the dust-up last Friday involving the Catholic high school students from Kentucky, the Black Hebrew Israelites and the Native American drum beater, Nathan Phillips. One reason this story caught my attention is it revolved around students from Covington Catholic High School, a college prep school in northern Kentucky, just across the Ohio River from Cincinnati. My first newspaper job was in Covington, working for The Kentucky Post, which was bundled inside The Cincinnati Post. (Both papers went out of existence in 2007, giving way to The Cincinnati Enquirer.) In the short time I covered sports for The Post, I occasionally wrote about Covington Catholic, although I have never been to the school and know nothing more about it than I wrote above. At any rate, the students were in Washington, accompanied by chaperones (remember that), for the March for Life. They were at or near the Lincoln Memorial, waiting for their buses, when the confrontation took place. The searing image that hit the pages of newspapers and websites all around the country was that of Phillips standing eye to eye with a smugly smiling student named Nick Sandmann. Like some of his fellow students, Sandmann was wearing a red Make America Great Again cap. It took a couple of days for all the facts to come out regarding the episode, partly because Phillips told different versions, none of them altogether accurate. Although no violence took place, some of the boys mocked Phillips, with some doing the “tomahawk chop,” others doing fake Indian dances and some hooting along with him when he played his drum and chanted. All the blame for this incident — 100 percent of it — lands at the feet of the parents and teachers who accompanied the boys (some of whom were very young, looking like freshmen and sophomores) and were supposed to be in charge of them. First of all, allowing the boys to wear Make America Great Again caps was downright stupid. It was asking for trouble. Yes, the March for Life was political, and if you’re marching for life, you’re probably a Trump supporter. Fine. But once the caps go on, you’re going far beyond making a statement of personal belief on one major issue. Instead, you’re signaling your embrace of everything the most divisive President in U.S. history stands for. In a sense, the parents and teachers were goading these kids by allowing them to wear those caps. But the biggest failing of the chaperones was failing to pull the boys back at the first hint of confrontation. Shamefully, what the parents and teachers did was allow the scene to unfold and play out before their eyes. When the Black Hebrew Israelites approached the boys, the chaperones should have barked orders, getting them to converge and back up. It would not have been difficult; the boys were completely under control and would have heeded the orders of their authority figures. Not only did the “adults in the room” not do that, one teacher allowed the students to gather steps away from the Black Hebrew Israelites to do school chants and sing school songs “to counter the hateful things that were being shouted at our group,” according to one student. 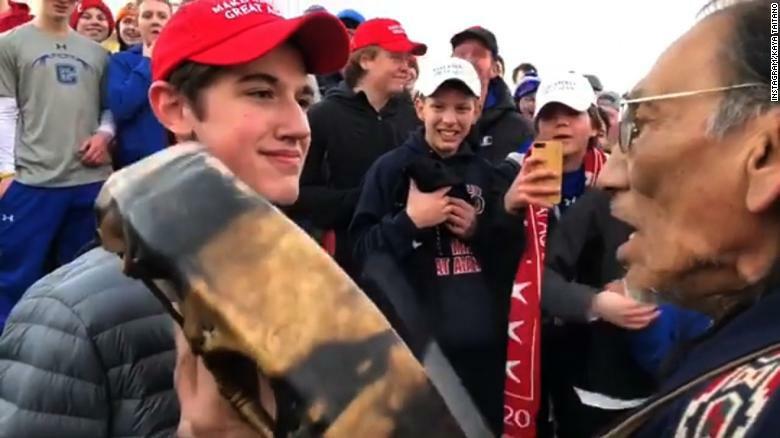 The failure of the chaperones to rein in the students led directly to the face-off between the Native American and the kid in the cap. …My strong suspicion is that the chaperones were more deeply invested in the politics of the situation than the students. That is, I think they wanted to let it be known theirs was a Trump-supporting group. As for the students, I feel sure many of them viewed the outing as a chance to go to Washington instead of going to school, and when tensions rose, they merely acted out, like kids do. In this instance, the parents and teachers who were on the scene are the ones who should be disciplined. Each of them should be grounded for two weeks and their driving privileges pulled. In addition, they should never again be allowed to act as chaperones…Put out the call for new chaperones at Covington Catholic High School. Only clear-headed adults need apply. The Black Hebrew Israelites and the lying Native American are the ones at fault. After many years of teaching, I would guess the chaperones were exhausted and just trying to make contact with the bus back home. I think the kids had the right to wear their hats. There’s nothing immoral or vulgar about the hats. The media are the most to blame in this because they never tried to get the facts or confirm what they were reporting. Except we now know that Phillips and the Black Hebrews initiated the contact. At first, the kids thought Phillips was with them and began dancing along with the drum, but then the Black Hebrews began cursing at the students referring to them using homophobic and racist slurs and threatening them. What I find interesting here is that you challenge the adults supervising these kids, but you fail to challenge the adults responsible for the confrontation. Are they not considered adults? Secondly, this has been a massive black eye for the media who launched a hate campaign against a group of teenage kids based on a totally false narrative. Indeed, in a rare move against a leftist site, CNN reported that Twitter suspended the account of the group who initially posted the misleading video that WAPO and other mainstream media outlets posted without investigating. Unfortunately, even now that the responsible media is racing to retract their false allegations against these kids, the calls for violence against them are ringing out from the usual whacked out “celebrities” and the kids and their families are receiving death threats from those on the looney left. Kudos to the kid for peacefully standing his ground in the face of a confrontation by a group of leftist thugs. They have every right to wear those hats and to express their political opinions. I’m just stunned why local law enforcement didn’t keep the groups apart. However, at this point, that matters not. This is a black eye for a lazy, biased press corps and yet another disgrace from the totalitarian elements on the left who would bring harm to children for simply expressing their beliefs. Keep in mind, this comes on the heels of the equally embarrassing Buzzfeed fiasco, story that actually contained the words “if true” and a CNN analyst denouncing a black conservative for his “white privilege”. Of course, they had the right…That is, if they were out on their own and not representing their school and not under the guidance of parents and teachers who were leading them and supposedly keeping them out of harm’s way. I guess I’ve got to ground Marcie and Altevogt, too. No driving for two weeks. If the Roman Catholic Church enjoys the benefit of tax exempt status, then I suggest they should not politicize a group of young men with MAGA hats and basically give them permission to act like unmitigated jerks. I agree, JImmy. I am beginning to wonder if these boys were used by adults for a political purpose. I do not understand why, when looking at all the issues facing this country, a group of all males who attend an elite all male private school, use a field trip to attend an anti-choice rally in the nation’s Capitol. What, there wasn’t any better use of time and money for a mission trip? Give me a break! And today it is also reported these same loudmouths were verbally harassing young women walking by before all this started. I’m sure the girls were asking for it, according to these take-no-ownership-of-their-behavior cretans. On the mark…and funny, Lisolette! Aren’t YOU the smug one, Jimmy. That boy had an awkward frozen smile, but it was not smug. He was afraid to move. He did not want to make the situation worse. He did not want his actions to be misinterpreted, so HE STOOD STILL. This activist Indian publicity hound got in the boy’s face. Not vice versa. Are we to back down when conservatives are bullied? Isn’t bullying wrong, period. Isn’t intruding into someone’s space, with or without a damn drum, an aggressive act? You’re a nice smiling guy, Fitz. I imagine you would have done the same thing as this young man. I guess you get what’s coming to you if you dress provocatively, no? Looks like Tracy hit it on the head about Phillips. I never said he was “the good guy” in this mess. I agree about the hats. Regardless of whose right it is to wear what, they are inflamatory and should not have been worn. It is simply a safety issue and the schools job is to put the students safety first. On the other hand, the news media is so ripe to find anything that meets their narrative. They will show/print anything they can find to place blame on the president. They have stooped to a new low, using kids. I for one am so sick of it. This is all about distraction from current government shutdown and, yes, fallout from the Buzzfeed story last week. It is interesting that some of the students have hired a PR firm run by a former McConnell aide (and a CNN Republican analyst) to run interference for them. I certainly know when I was a teen my folks or myself didn’t have the money to hire a big name PR firm to defend me. And, oh, I see now some lawyer on Fox and Friends is threatening to sue a number of members of the press for libel if they don’t issue apologies to the school kids. Who is paying for this guy? This is another circle the wagons thing for Trump and conservatives. The bad thing for them is that their share of the overall population that has that opinion is shrinking. These people are losing control of the narrative as they have become the minority of opinion in the country. They are so used to getting their way for so long they will be kicking and screaming until they realize it is no longer helping their cause. New CBS poll this morning shows 71% of the country oppose Trump’s wall and Trump’s approval drops to 36%. We are getting closer to having 2/3s of the country opposing him and the policies he represents. And that the vast majority blame Trump for the shutdown (who did say he would own the shutdown in live video). This is doing something I did not see happening again in my lifetime is that the majority of public is becoming sympathetic to government workers. The other thing stories are beginning to pop up that average working people are realizing that Trump isn’t really in their corner (a stunner I know). They regret now voting for him to “shake things up” or “send a message”. They now know that was a big mistake. As I heard Republicans say after the 2016 election: “Elections have consequences”. I guess so not so much for them in their minds after they got trounced in November. I consider myself fairly liberal and generally get the dry heaves when I see a “MAGA” hat. Now that we have seen a vastly more contextualized accounting of the three groups and after having read/watched several videos from several vantage points, you can see it was a combustible situation and I don’t think all the boys were menacing or meaning to do harm. High school boys aren’t always equipped to ignore crazy when it gets in their face. And yes, some of the kids were jerks. But the adults — specifically the offensive Hebrew Israelites and the not-entirely-accurate-nor-consistent Native American and the chaperones — need to be held most accountable. Quite frankly, news organizations need to better job with these videos that just bait the public. I get the David Brooks comment but that is not good enough. Social media posts should not be an excuse for bad journalism. Find a source for god’s sake. You know, I haven’t watched any of the videos. I’m not really interested. I formed my opinion on the basis of the image of the face-off and what I read about the incident. When I saw those red hats and knew those kids had chaperones, it was pretty clear to me where the problem lay. It should never have happened. But wherever you see a cluster of those hats, you just know it’s a combustible situation.